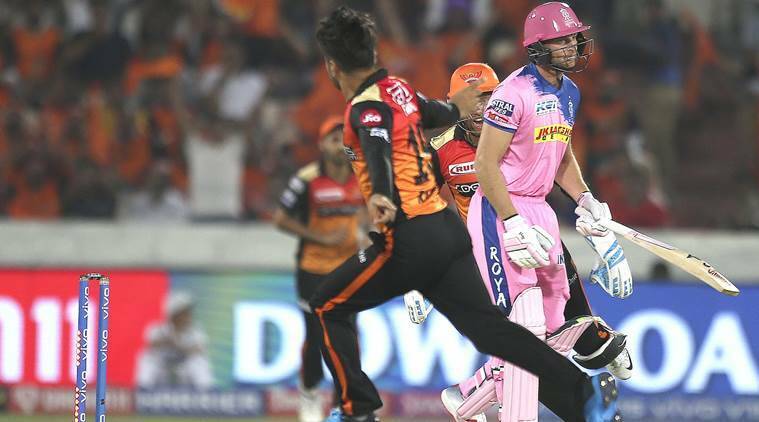 IPL 2019, SRH vs RR Highlights: Sanju Samson’s second IPL ton was overshadowed by David Warner’s blistering fifty as Sunrisers Hyderabad beat Rajasthan Royals by five wickets to register their first win in the ongoing edition of the tournament on Friday. SIXXXXX! And SRH win by 5 wickets. Sensational finish by Rashid Khan as Hyderabad win with 1 over to spare. The successful chase of 199 is the second highest chase ever by SRH. Simply outstanding! Vijay Shankar pulls it perfectly through square leg. Unadkat tries hard but can't stop it. 13 came off the over. SRH- 130/2 after 12 ovs. Hyderabad need 69 runs in 48 balls. Sanju Samson remains unbeaten on 102 off 55 balls. Rajasthan Royals end on- 198/2 in their 20 overs. SRH need 199 to win. 123 runs in the last ten overs. Bhuvi went for 45 in the last two overs. Unbelievable. This was Rahane's 27th IPL fifty but his first in the last 8 IPL innings. Incidentally, his last IPL fifty: 65 was also against SRH at Jaipur in April 2018. 100 up for RR. 50 for Ajinkya Rahane in 38 balls. Giving him company is Sanju Samson (44). The partnership is 87. SRH struggling with their fifth bowler. Rajasthan Royals moving slowly after Buttler's departure. RR- 35/1, 6 ovs. Shahbaz Nadeem brought in starightaway after the powerplay. In the last two IPL seasons, nine matches at the Rajiv Gandhi have been won by the team batting first and six have been won by the chasing team. Jos Buttler , Stokes , Smith, Archer- RR. Rajasthan Royals won the toss and opted to bat first. The previous season the Rajiv Gandhi International Stadium was the venue with the lowest average run rate in IPL. The home supporters turn up in large numbers as Sunrisers play their first home fixture of the season. Will the hosts live up to the expectation? Hello and welcome to the LIVE COVERAGE of the Indian Premier League match between Sunrisers Hyderabad and Rajasthan Royals at the Rajiv Gandhi International Cricket Stadium. Both teams are looking to secure their first win of the season after going down in their opening fixtures. Sunrisers lost their first match against Kolkata Knight Riders by six wickets, while Rajasthan squandered from a formidable position in their opening fixture against Kings XI Punjab, eventually losing the contest by 14 runs.